I'll be honest, I usually don't make New Year's resolutions because, after thirteen years of teaching, January always feels like mid-year with August being the first day of my new year. That being said, I am challenging myself this year to do something a little different and I hope you can join in and follow along. Throughout 2019, each month, I will be focusing on one area of my classroom and work to organize *just* that part. I think January is the perfect time to start since we're in the thick of it all and I'm able to create much more authentic systems with students in my classroom to act as guinea pigs try it out. Teaching third grade, I also plan on elisting their help for some of these challenges, but overall, it will be me sorting, purging, donating, organizing, and once and for all deciding if this unit/ manipulative/ decoration/ bin/ etc. is necessary in my room. Why now? The main reason is out of necessity. We moved into a new building at the start of the 2017 school year and, while there is more natural light and the heating and cooling always work, there is a noticeable lack of storage. I've thrown some piecemeal solutions together over the past year and a half and, to be honest, it's more stressful than I realized. When things don't have a proper home, or when I'm trying to hang on to too much, the visual clutter really throws me off and I'm ready to part with that stress in 2019. 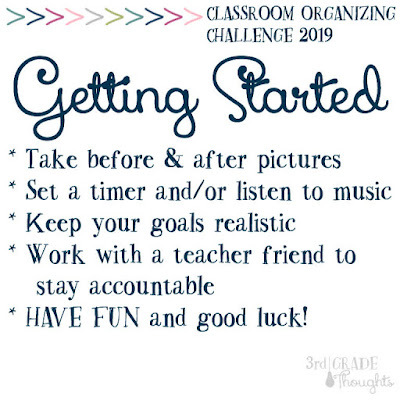 So please join me in this Classroom Organizing Challenge! I tried to make the areas as applicable to every teacher, no matter the grade level, since I believe that if we sort through this all together, we can be much more successful, especially since our years are full of so many highs and lows in terms of energy. Below are the list of topics and months, so you can join in and/or catch up anytime. 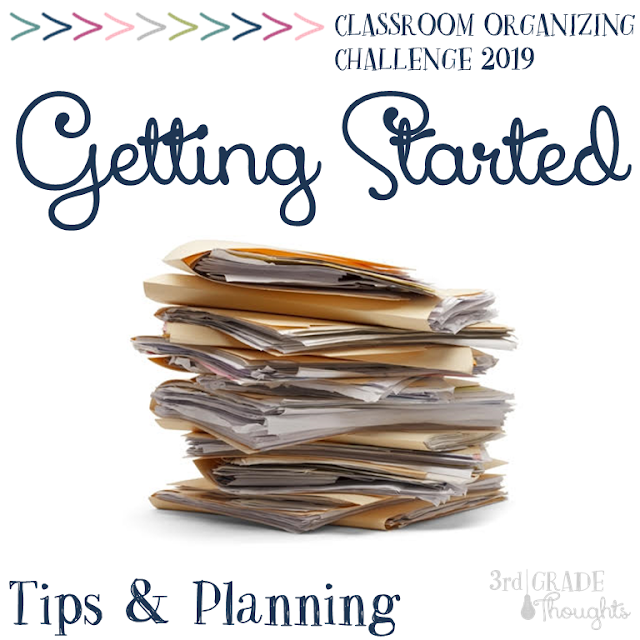 You can always catch up on the Classroom Organizing Challenge Page HERE. I truly thing before and after pictures will save the day! Plus, the after picture can serve as a baseline for maintenance throughout the entire year. For students, showing these before and after can help them take ownership of their space and, if they are extra-tidy, can serve as a challenge to get it even *more*organized than before..... we'll see if that actually works. Do you have a Spotify account? I am a *huge* music lover and have to be singing and dancing during any painful process (like folding laundry, doing my budget and cleaning/organizing) and I have a great station you might enjoy: Energizing Classics. Click HERE to check it out. It's full of singalong 80's music, including Journey, Michael Jackson, and even a-ha, so it's just guaranteed to put a smile on your face. This does *not* need to take 30 minutes a day... in fact, it shouldn't or we'll all quit by next Monday! I'm planning on organizing for the duration of two songs from that playlist, and on average that's about 3-4 minutes per song, so less than ten minutes a session. If I can do more after that, great! If not, I can work on it more later in the day, after school, or during planning time. Taking 6-8 minutes of my planning time a few times a week is a sacrifice I'm willing to make to get my space more in order. Be sure to follow along with me on Instagram @3rdgrthoughts on both my feed and my IG Stories throughout the year. Tag any of your before & afters, progress, or projects using #ClassroomOrganizingChallenge. Together we can finally tackle the visual clutter and stressful spaces! Join me in a few days when I dive into January's challenge of Student Desks!